Why can't it work this way in real life!!! The beginning of the year is coming and I am about to be inundated with students whose brains went on vacation in the summer. They are often energetic about school (having rested) but not really ready to be back. One way that I forge a bond is to tell them up front I am imperfect. In fact I have five words that I used to always look up because otherwise I don't spell them correctly. I have found solutions for four of them but the first one still eludes me. These words aren't typos. They are just words which, for some reason or another eluded me. Calender- I don't say, "Cal-en-dar" I say, "Cal-en-der" so this was always a hard one for me. How do I remember? I cheat! I use Spanish. I remember that a calendar "gives" me the date. The word for give in Spanish is dar. If you don't speak Spanish you can remember that a Calendar is a sandwich. It goes, a-e-a. Excersize- I worked at a gym throughout high school and college, yet I still manage to write Excersize way more often than I'd like to admit, and I write it a lot in worksheets: Exercise 1. I think I start to write Excel, and then add on a size... I am not sure but that one is embarrassing. The worst part is, I butcher it so badly that spell check can never fix it! "Did you mean excessive?" or "Did you mean exorcism?" This is the one I've never found a way to fix in my brain.If you have any advice please let me know! 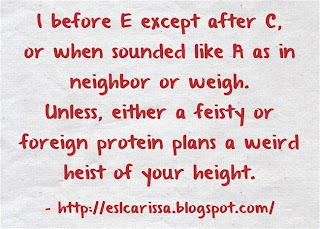 Expereince- It has been argued that one of the only spelling rules people know is, "I before E except after C or when sounded like A as in neighbor or weigh." It does have exceptions, but overall this rule is pretty good. Nonetheless it does not work for me with experience. Every time I would type experience my brain would switch the e and i. Other people have problems with experience because they tend to end it in ance instead of ence. My little trick (which helps both) to remember proper spelling was to pick a word I never spell wrong: patience. Now whenever I go to type I try to remember, to have patIENCE to spell experIENCE. 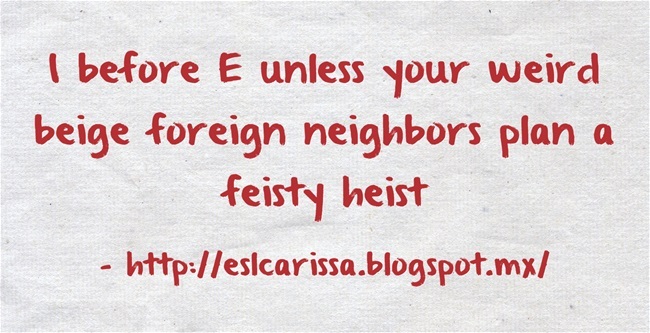 Its / It's- I teach English and I am really good at your vs you're and they're vs their, but this one was hard for me! Is it it's or its. 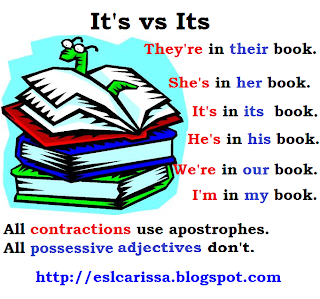 I know people have always said, "Well it's is a contraction and its isn't." That's great, but it didn''t help me. Because then I ended up sitting there going, "So wait... is it's the contraction or its?" Regardless I finally found a way to stop this bad habit. The only thing that helps me is by thinking of a sentence like "They're in their book." Then I think to myself, "Right so their doesn't have an apostrophe when it is possessive so neither does its." 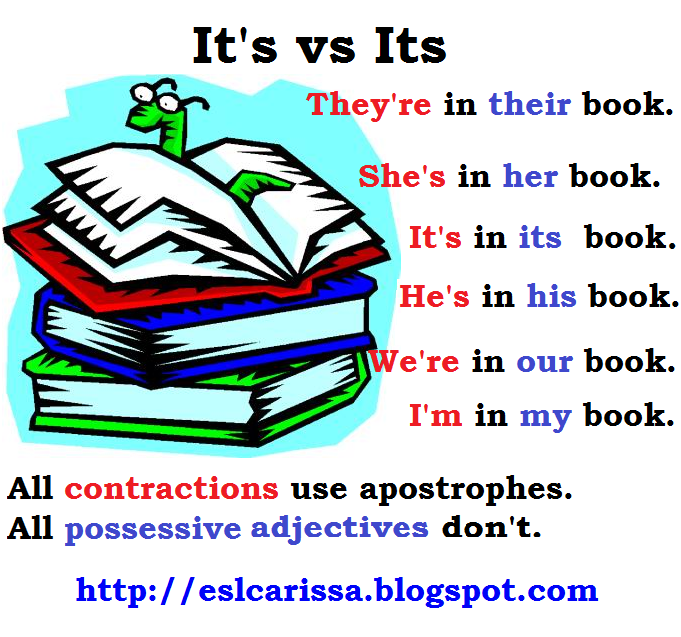 It works great because none of the possessive adjectives have apostrophes. 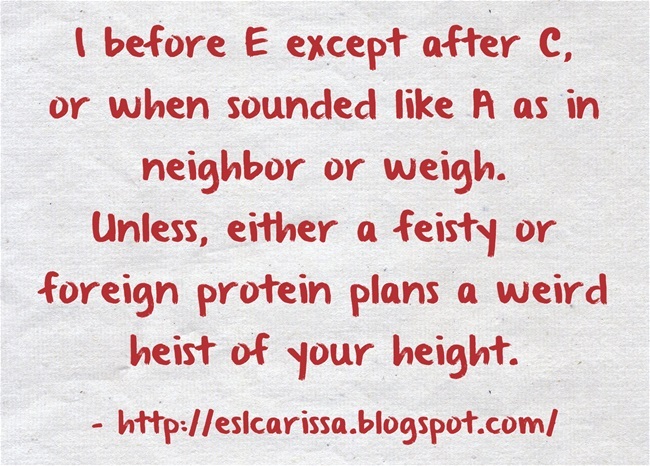 Pronunciation- I blame this on being an English teacher. Whenever I start to write Pron... my fingers go straight to pronoun and then I add a -ciation. Luckily there's a memogram for this! Memograms are anagrams created by Peter Spenser which are meant to help you remember how to spell a word. So, with proper pronunciation you will "ruin no caption" when reading aloud. There's only there's only two Os so I have to leave my extra O behind. If you have a word you can never remember you may want to consider making an anagram to help you. The book is available to download for free if you click here or on the book's cover to the right. What about you? 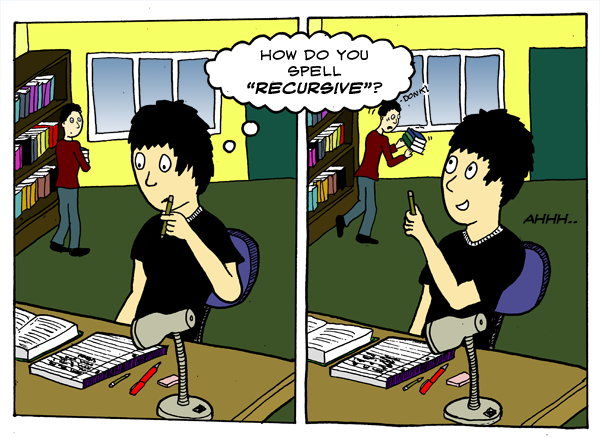 Are there any words that you used to spell incorrectly, but finally found a way to remember them? Or are there any words you still struggle with? “Doing it” at a skating rink must be very cold EXERCISE! For it's/its, just remember that it's = it is, and that's all you need to know. I think that should be easy to remember because all contractions stand for two words. Then, when you need to know which word to use, if you can replace "it's/its" with "it is" and it makes sense, use "it's", the contraction (eg - IT IS going to be a great day.). If the sentence does not make sense replacing "its/it's" with "it is" (eg - I saved the pie for last because of IT IS sweetness.) use the possessive "its" (I saved the pie for last because of its sweetness). One word I always have to fix when typing is pleasant. I write "plesant" first, then hit delete and add the "a" as soon as the squiggly red line shows up -- usually before I can finish typing the word. And I've realized it has the same beginning spelling as "please", but for whatever reason my mind can't make that connection. I think it's because the vowel sound of "please" is "ee", whereas "pleasant" has a different vowel sound, so why would they have the same vowels in their spelling? Oh English! ELT Research Blog Carnival- Bottoms up!